Looking for a neat and organized display option? Look no further! 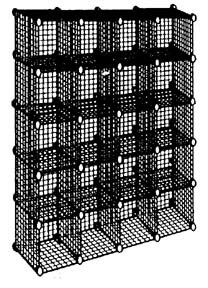 With this Square 20-Cube Rack you can present a multitude of items; such as clothing, shoes or craft items. This Wired Shelf is a wonderful choice for your store, office and even your home. Organize your kids’ rooms with this Display Shelf and cut the clutter from your home. 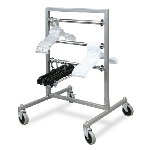 For ease in assembling this Wire Rack Display you may also purchase the optional rubber mallet. Panels are 14" x 14"